One of my nieces birthday is coming up and originally I wanted to make her a bag, however she is turning 17 and honestly I have no clue what type of fabrics she would like so I thought I would play it safe and decided to make her something hand stamped (my new found love…see post below :). 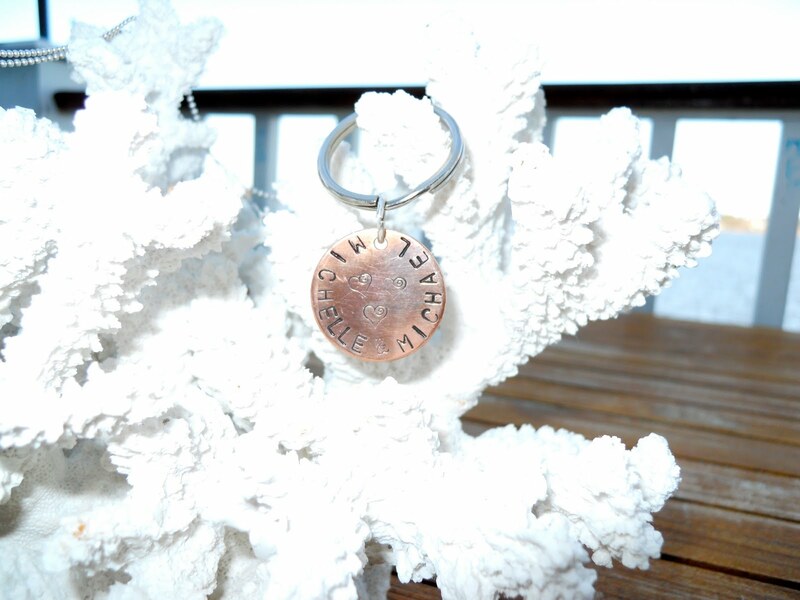 Anyway, I stamped “Brittany” on a 1″ hammered sterling disk over a 1″ copper disk that I stamped “x o” in the center and when you lift up the sterling disk the words “you are loved” are stamped around the edges, kind of like a secret message :). 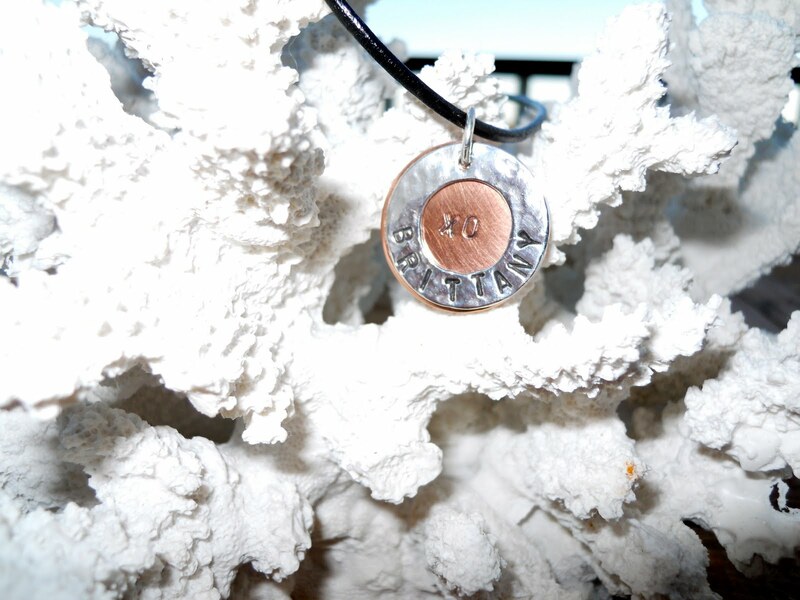 About a year ago or so all of the families in our Girl Scout Daisy troop pitched in and got myself and our two other leaders adorable necklaces with our kids names hand-stamped on small sterling disks as a thank you for our first year in Girl Scouts. 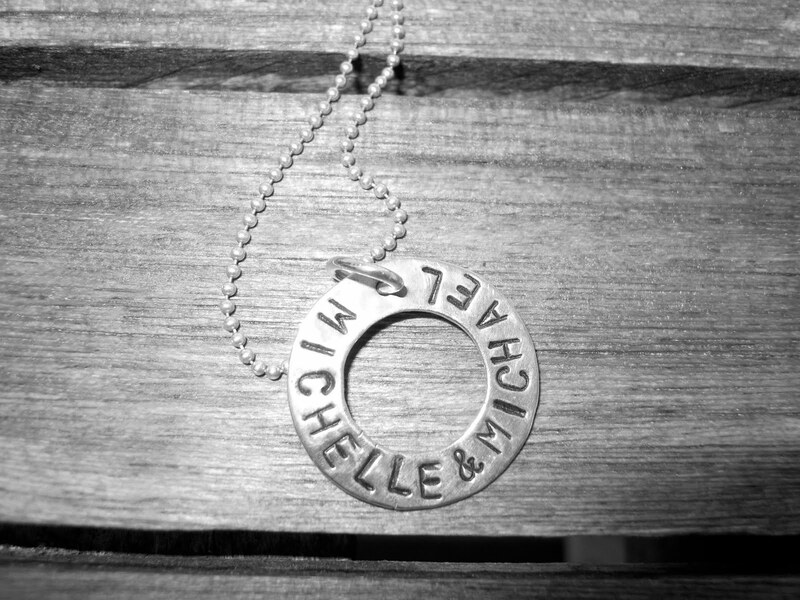 We were all so touched by this amazingly thoughtful gift and I personally have only taken mine off about 4 or 5 times, that is how much I adore this thing. For a while now I have been thinking of doing some kind of stamping, it kind of fits in with the scrap booking I enjoy however I do digital scrap booking but you get the point…it’s crafty. 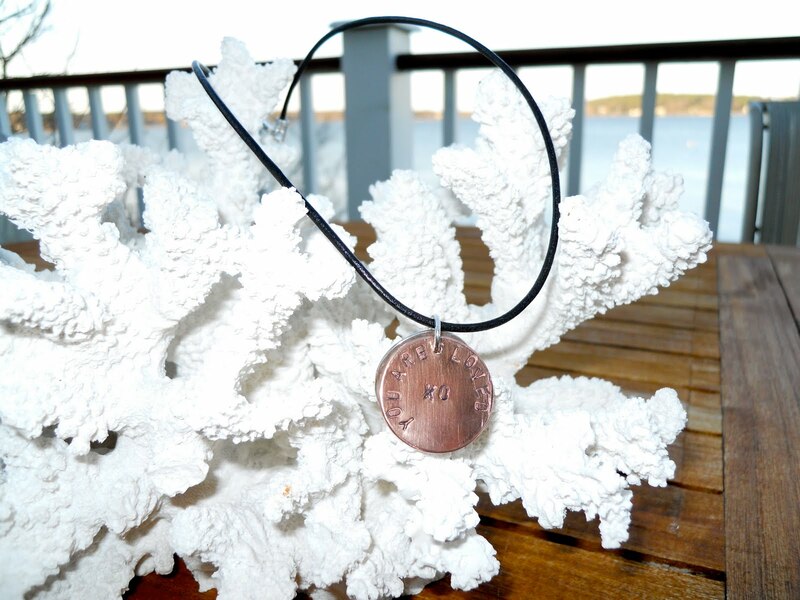 First I practiced on this copper disk…it’s not as easy as it looks! 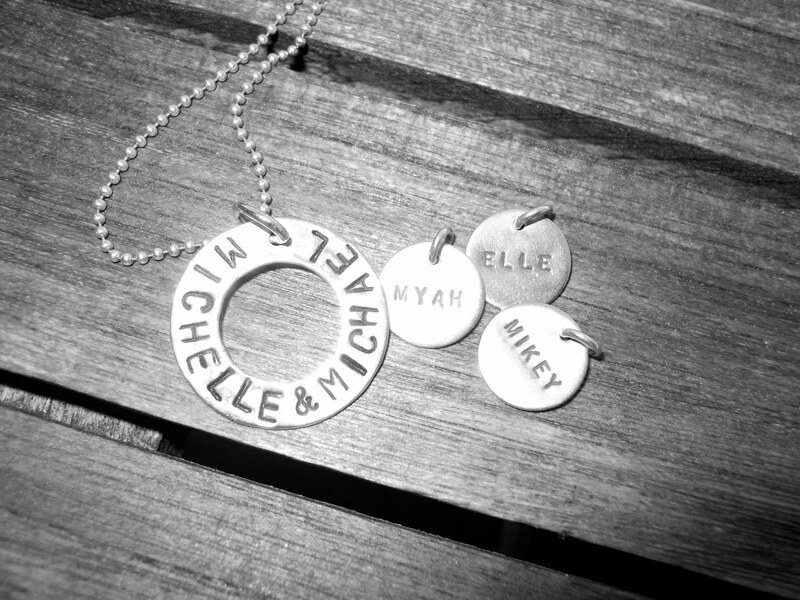 These are the disks that came on the necklace from the Daisy families…aren’t they just so cute?? 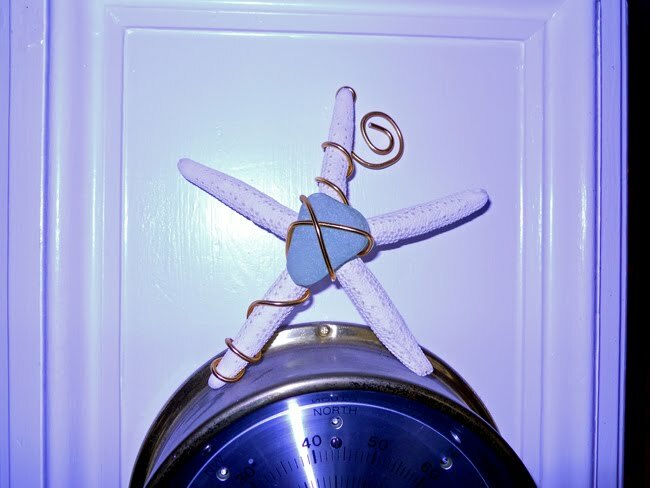 Our family loves just about anything to do with the ocean and I love to use ocean inspired touches in our home to give it a relaxed beachy feel. 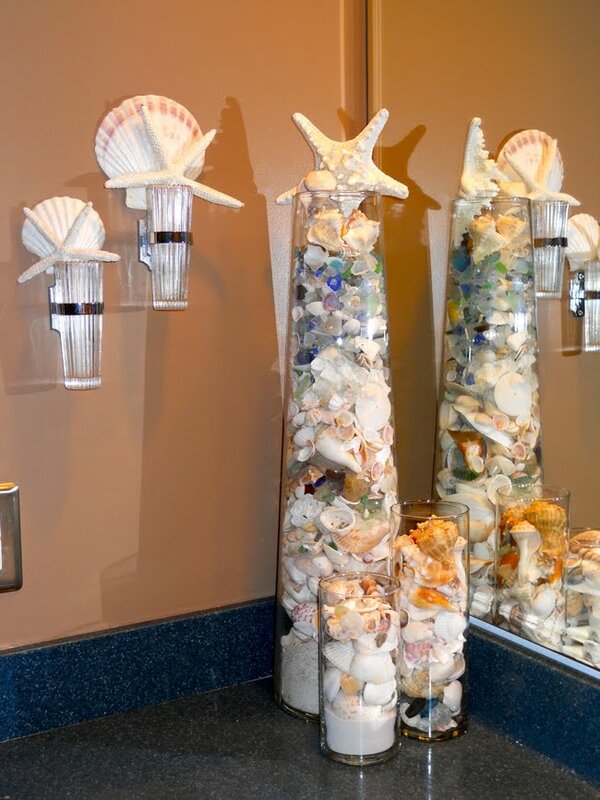 Whether it’s shells, sea glass, drift wood, coral or even a horse-shoe crab, we find ways to display them in unique and pretty ways around our home. I am also a huge lover of home decorating tips that I find in magazine, online, etc. 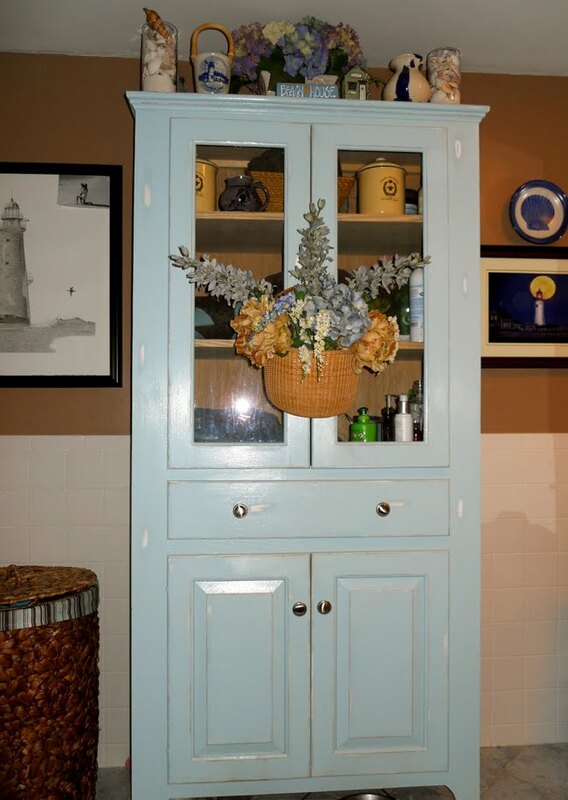 so I thought I would share a few things that I have done in our home that are really easy and relatively inexpensive but add a warm, classy touch. 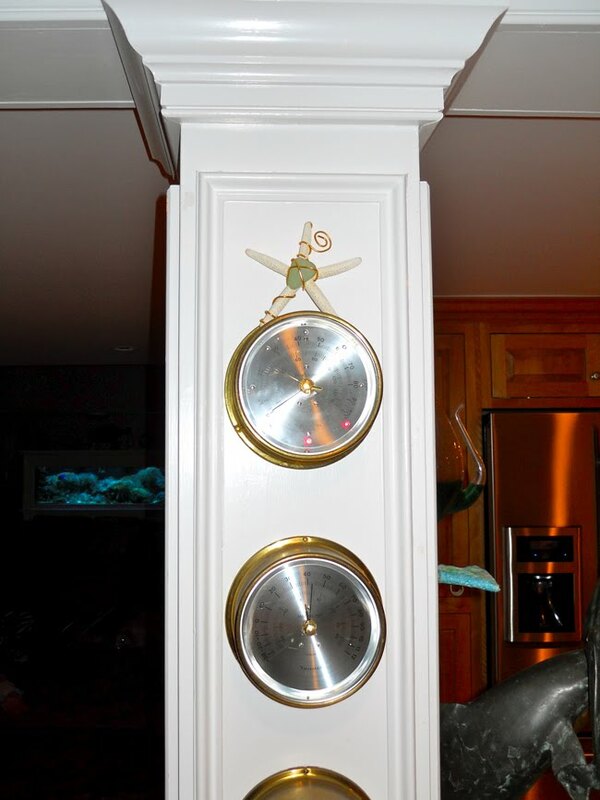 I could have taken a bunch more pictures of “nautical” items scattered around our house, but these are things that I have personally done and things that you can do too! Originally this dish had fruits and dried items for Thanksgiving that I didn’t create however after Thanksgiving I added shells, sand dollars and star fish. 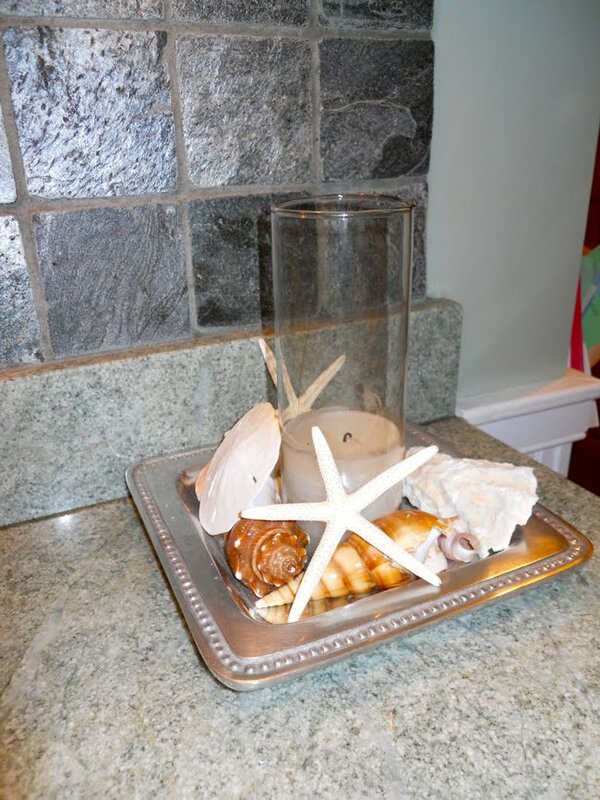 Most of these sea shells and sea glass we found and the glass holders were purchased at Home Goods…the best store on earth! 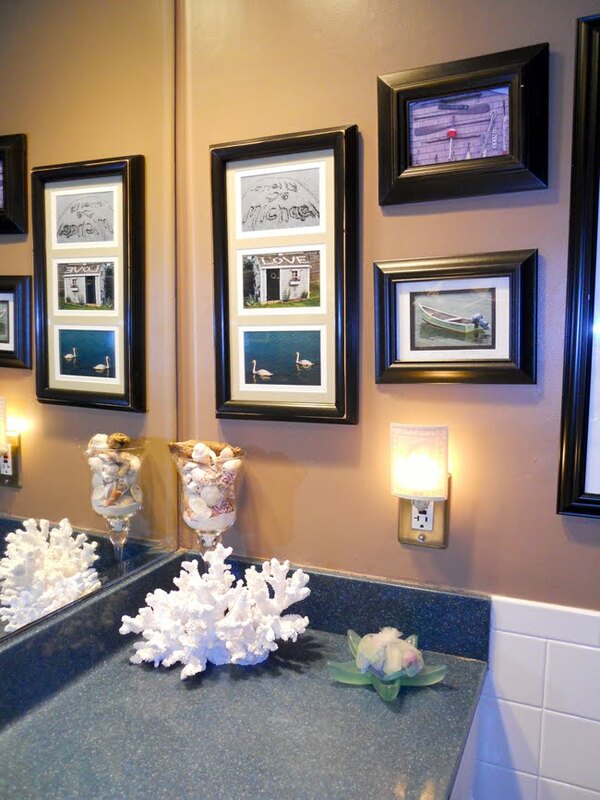 We are HUGE picture people and these photos were taken by us, matted and framed. 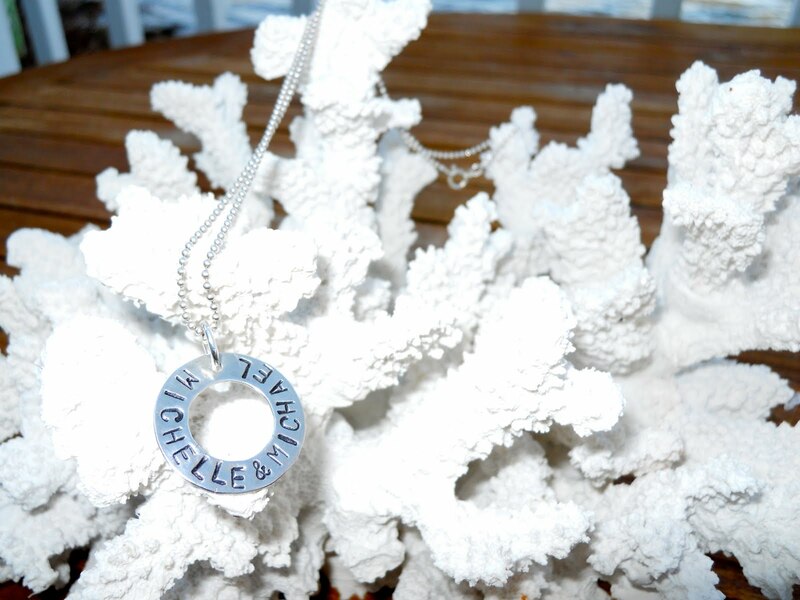 The faux coral is from Kohls and even though I don’t like faux ocean items I really do LOVE this one! 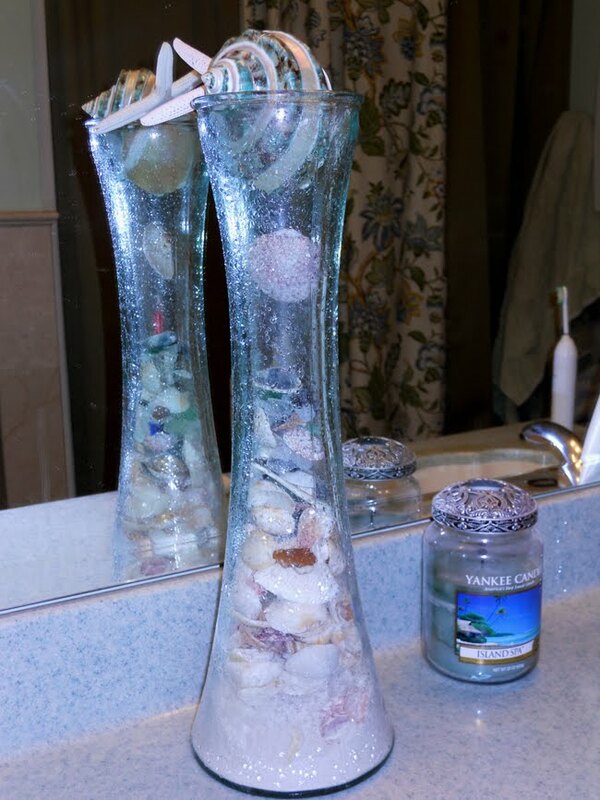 Another glass piece from Home Goods filled with sand from Siesta Key Beach and sea shells we have collected over the years. 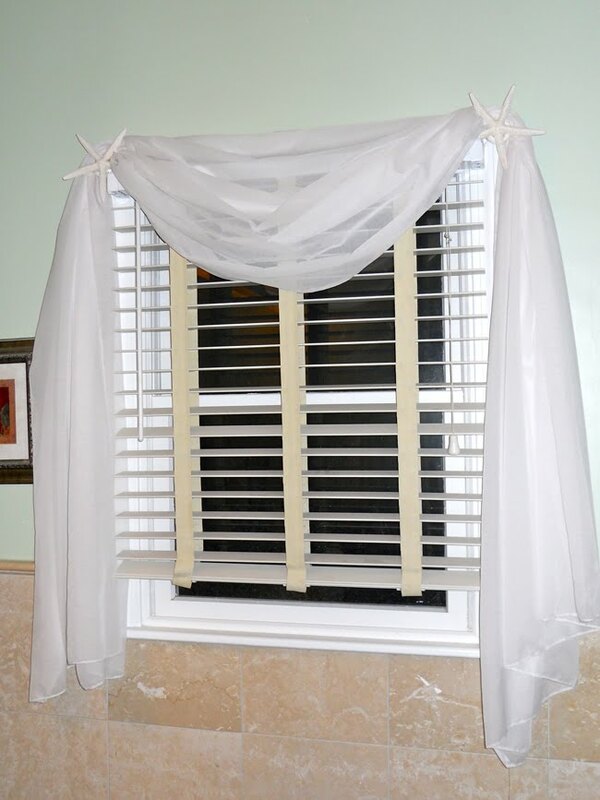 For my master bath window treatments I started with larger white wooden knobs, hot glued star fish on each one, screwed them into the window trim and then added a simple white sheer curtain that I serged around the unfinished edges….I love the beachy-romantic feel of these! See all of these things are super easy right? Hope I’ve given you some tips that you can use for your beach inspired house! 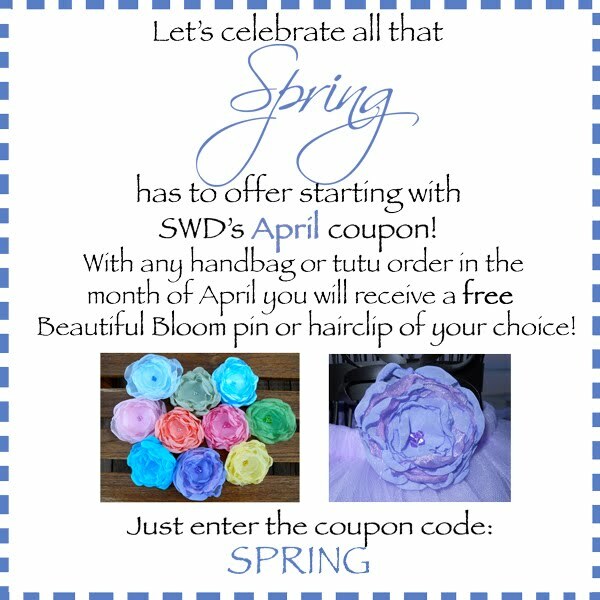 SWD’s April coupon is here! I thought it was fitting to use my Beautiful Blooms for my April coupon since we are finally starting to see some flowers blooming here in Massachusetts. So, for any handbag or tutu order placed in the month of April you will have your choice of a flower pin or hair clip. These flowers are available in almost any color and they look so pretty on a jacket, a blouse or even in your hair! Happy Spring and April Fools Day! 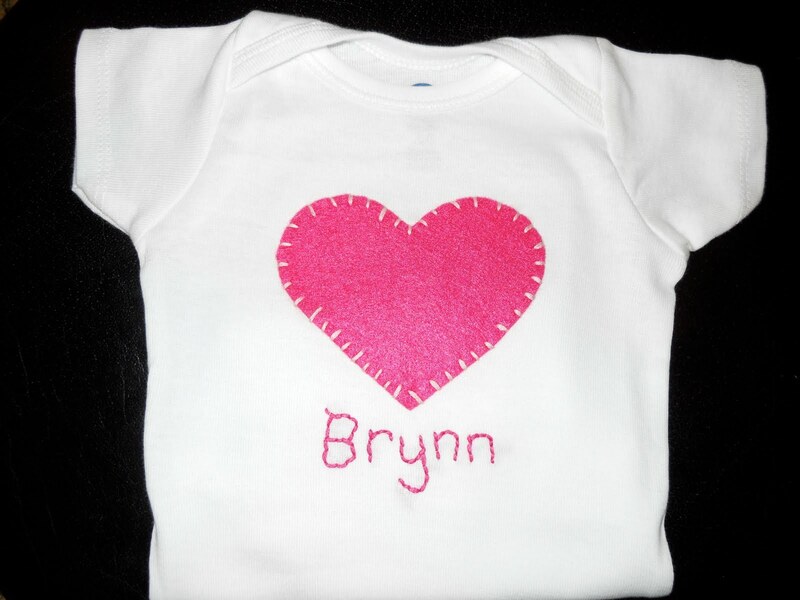 I just recently made this heart Onesie with hand-embroidered name for one of the retail stores that carries some of my things…I really like her name! 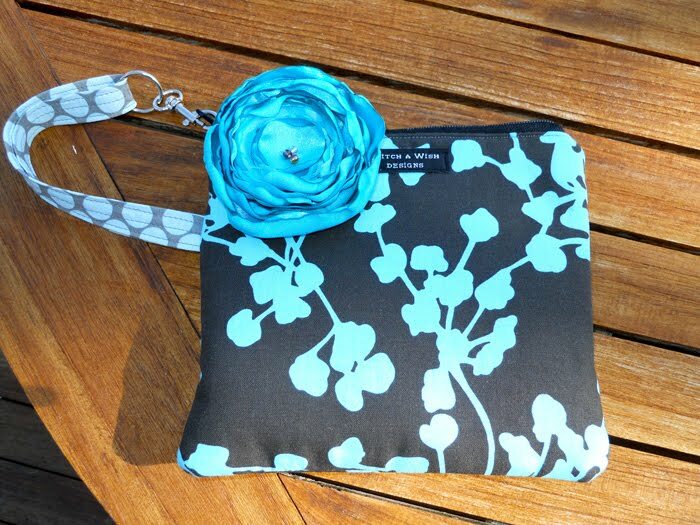 Coriander Pine On the Go Wristlet….for me! I LOVE this Amy Butler fabric called Coriander Pine in a dark grey and the turquoise, it has always been one of my favorites! Lately I’ve been going through all of my fabric trying to decided what fabric to use to make myself a new wristlet and since I only had a little bit of this fabric left I decided to use it for me! (I know, selfish but I will be ordering more). Recently another donation was made to the national wish-granting foundation on behalf of Stitch a Wish Designs (legally I cannot use their name). Each time I make a donation, no matter the monetary value, it really does make my heart smile. Jars…they aren’t just for jelly, pickles and sauce anymore!